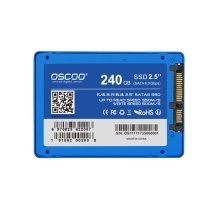 This solid state drive (SSD) is an innovative data storage device which using NAND flash memory replace the traditional mechanical hard disk drive(HDD) disk, so that it provides high reliability, stability, read and writing speed, shock resistance with low power consumption and no noise features. It is universally compatible for the most of computers&apos; hardware system with SATA3 interface, such as laptop and desktop etc. Universally compatible for the most of computers&apos; hardware system with SATA3 interface, such as laptop and desktop etc. Quick read speed up to 500MB/S, writing speed up to 400MB/S. No mechanical components design, avoiding shocking damage, shock-resistant. Wide work temperature range from 0℃ – 70℃. Stable, support Devsleep mode and BCH ECC.